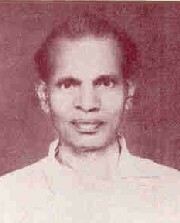 Padmashree Bhagaban Sahu, an outstanding dance teacher, actor, singer, percussionist, director, excperimenter and choreographer made his final exit on August 12, 2002 . Throughout his life, whenever he gave a performance, he danced his way into the hearts of the audience irrespective of their nationality and language and become a celebrity. There by he carved out a place for himself in the cultural history of Orissa. Bhagaban Sahu is no more and yet his very much present. This statement may sound paradoxical. But it is true. Though his mortal remains have been cosumed by fire, his lofty ideal of keeping alive and enriching the folk dances of Orissa, especially Ganjam district, continued to be a source of inspiration. The dance forms he perfected with so much dedication, love and care continue to find expression through the rhythmic movement of bodies and perfect footwork of his ardent disciples. His long life of eighty years is an amazing story of success, one can't help wondering about the secret of his success. How could a person born into a middle-class Oriya Brahmin family become the guest of Queen Elizabeth II ? How could the individual with formal schooling only up to class VIII rise to the level of getting admiration of eminent scholars, intellectuals and Political leaders like Rajendra Prasad, Jawaharlal Nehru, Radha Krishnan, Fakiruddin Ali Ahemad, Charan Singh Indira Gandhi, Marshal Tito and luminaries in other fields ? Isn't it a wonder that the thunderous drum beat of this simple villager, who spent most of his life in his native place Badakusasthali, reverberated across the world and made the hearts of the audience in London, Spain, Africa, Syre, Bhutan, Damascus, Abu Dhabi and New Zealand beat in union with it ? Bhagaban Sahu's tremendous success can be attributes to two factors. The first decision to select the road not taken by other. Instade of being satisfied with just giving performance of acting, he undertake the Herculean task of founding Kala Vikash Kendra at Narendrapur in1954 and running it efficiently. He took this grate decision as he had been anguished by the decline of folk dances. These dances are the spontaneous, powerful expression of the joy and sorrow, fear and excitement of simple men and women having close ties with mother earth. Naturally, these colourful dances began to wither and jade in the rapidly expending concrete jungles of urban society. Moreover, they faced tough competitions from another new form of mass entertainment, namely cinema. Therefore Bhagaban sahu, a man of action, didn't waste time in blaming other for this sad state of affairs or wallowing in self pity. He took quick steps to inject life into the folk performing arts on the death bed. To him survival of great culture, tradition was important. Its perpetuation was all the more important. Hence he decided to train talented youth in folk dance and classical music. Bhagaban sahu had great passion for dance, music and drama right from his childhood. He was a very talented actor who could breathe life into well-known characters like Kirtivirjya, Kalapahad and Sambarasura. He had founded an open air theatre group in his youth itself. In adition to all this, he had learnt so mush, he was bent on producing befitting heirs to this great cultural treasure. He yearned to hand over all that he mastered in dancing to his successors undergoing training in Kala vikas dendra. The rigorous rehearsals were a great labour of love for him. Because of his wonderful vision regarding the folk dances and hard work day in and day out, Kala Vikas Kendra, the epitome of his ideals and dreams, obtained recognition (from the central govt. of India) as the International Dance Training Centre in 1974. It could get catapulted to International level in just tow decades after its inception in 1954. Bhagaban Sahu was man of deep strong conviction this was the second factor responsible for his extraordinary success . his entire life is an excellent example of his commitment to himself, he never made any sort of compromise as far as his goal was concerned. Be it giving up his studies or undertaking strenuous pilgrimage to Ayodhya, varanasi, Mathura, Haridwar, Rishikesh and Badrinarayan in spiritual quest or founding a theatre group or undergoing tyraining in gymnastics under the tutelage of guru Sri Radha Syam Das or organizing a circus party in the thirties or performing dare-devil feats like stopping a motor car while its engine was running, binding crow bars and riding motor cycle in a wooden globe popularly known as death well- bhagaban Sahu was guided purely by his own inner voice. Each and every project Bhagaban Sahu had undertaken showed his indomitable will and perseverance. Kala Vikas Kendra being his most favourite brain child, he nurtured it with great passion, vigour, vitality, enthusiasm and above all utmost dedication. He had developed tremendous concentration because of his vigorous trainging in gymnastic and dance as well as regular practice in mediation. His dedication combined with superb consentration paved the way for his success in training dances capable of giving excellent performances in folk performing arts like Ranapa, Chodheya, Gumrah, DaraBhuja Durga, Loudi, Paika, Jole, Binakar, Panch Badya, Dhumpa, Mridanga Badya. Bhagaban Sahu along with his troupe of artistes participated in a large number of dance festivals, competitions, and programmes. Performing RANAPA dance in childrens' film and Dance Festival was an important milestone in his career. On every occasion, Bhagaban Sabu proved his artistic excellence and become the mush praised and prized artistic. Bhagaban Sahu brought honour and credit not only to himself but also to Orissa. The soul of this dear departed will rest in peace only when Kala Vikas Kendra continues to flowish and his disciples get perpetual guidance from his foot prints left on the sands of time.